NO CHAIN DELAY Potential rental income of 600PCM. 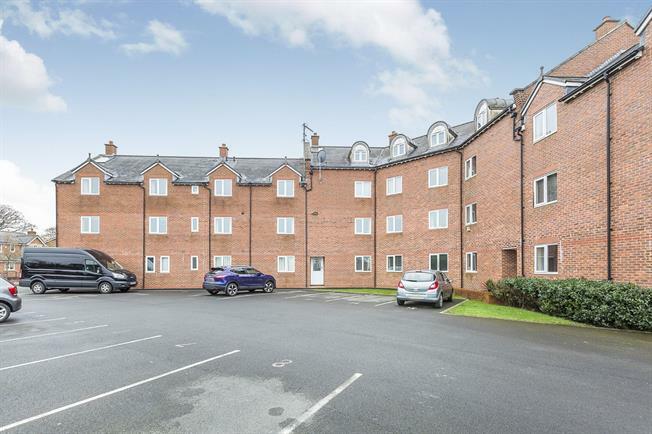 A beautiful contemporary two bedroom second floor apartment offering modern open plan living accommodation and aspect views across open fields. Ideal for a young couple or first time buyer. An internal inspection is highly recommended. The accommodation is home to an open plan kitchen with a host of integrated appliances and a beautiful unique lounge allowing the space to be filled with natural light. There are two double bedrooms plus a three piece bathroom suite plus the additional of a large utility cupboard. There is a private communal entrance with secured intercom system, external mature surrounding gardens and an allocated parking space.. Secured fire escape entrance door. Electric wall heater, carpeted flooring, cupboard housing the cylinder. Access to the loft, boarded for storage. Two double glazed uPVC windows facing the front. Two electric wall heaters, part vinyl and carpeted flooring, tiled splashbacks. Phone point, television point, Sky point. Roll top work surface, fitted wall and base units, stainless steel single sink with drainer, integrated electric oven, electric hob, extractor fan, integrated washing machine, space for fridge/freezer. Double glazed uPVC window facing the rear. Electric wall heater, carpeted flooring, fitted wardrobes. TV point. Double glazed uPVC window facing the rear. Electric wall heater, carpeted flooring. TV point. Electric towel rail, vinyl flooring, part tiled walls. Low level WC, panelled bath with mixer tap, shower over bath, pedestal sink with mixer tap. Extractor fan.